The Address Book, a key and controversial work in Sophie Calle's oeuvre, lies at the epicenter of many layers of reality and fiction. Having found a lost address book on the street in Paris, Calle copied the pages before returning it anonymously to its owner. She then embarked on a search to come to know this stranger by contacting listed individuals--in essence, following him through the map of his acquaintances. Originally published as a serial in the newspaper Libération over the course of one month, her incisive written accounts with friends, family and colleagues, juxtaposed with photographs, yield vivid subjective impressions of the address book's owner, Pierre D., while also suggesting ever more complicated stories as information is parsed and withheld by the people she encounters. Collaged through a multitude of details--from the banal to the luminous, this fragile and strangely intimate portrait of Pierre D. is a prism through which to see the desire for, and the elusivity of, knowledge. Upon learning of this work and its publication in the newspaper, Pierre D. expressed his anger, and Calle agreed not to republish the work until after his death. Until then, The Address Book had only been described in English--as the work of the character Maria Turner, whom Paul Auster based on Calle in his novel Leviathan; and in Double Game, Calle's monograph which converses with Auster's novel. 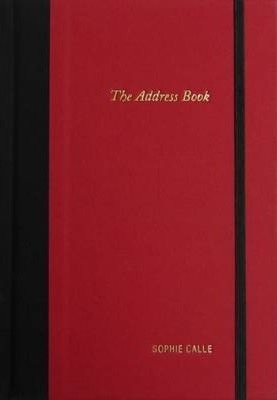 This is the first trade publication in English of The Address Book (Gemini G.E.L. in Los Angeles released a suite of lithographs modeled on the original tabloid pages from Libération in an edition of 24). The book has the physical weight and feel of an actual address book with a new design of text and images which allow the story to unfold and be savored by the reader. Given the ease with which we can access the lives of strangers in 2012, Calle's snooping might register as a quaint trespass from another era, an analog and ultimately harmless kind of proto-Facebooking. But her old-school sleuthing is daring, more so than it was in her earlier projects, such as Suite venitienne, in which Calle followed strangers, and La Filature, for which she hired a detective to tail her. The Address Book's adventure is riskier and more unpredictable.--Heidi Julavits "Bookforum "